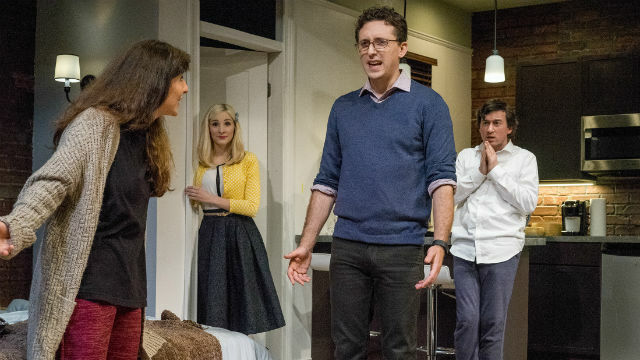 A scene from “Bad Jews” at Cygnet Theatre. Truth be told, the characters aren’t so much “Bad Jews” as they are odious people. Well, two of them, anyway — the most verbal and vociferous. The family in Joshua Harmon’s 2013 dramedy — three cousins (plus one shiksa girlfriend) — don’t interact; they scream, berate, pontificate and judge. Oh boy, do they judge. Daphna (née Diana), the über-Jew, has nothing but contempt (laced with jealousy) for her cousin Liam, who’s richer, smarter, better educated (he’s at Yale, gunning for a Ph.D.; she’s about to graduate from Vassar), and much more supercilious. Though she’s no slouch in the condescension department either; she just picks lesser adversaries. Daphna’s got a lifetime of resentment toward Liam, but when we first encounter her, she’s fulminating because he was too busy skiing in Aspen to attend their beloved grandfather’s funeral earlier that day. Once Liam enters, with blonde bimbette Melody in tow, the cousins will go at each other’s throats about religion (he’s an avowed atheist, who called himself a Bad Jew when he spitefully brandished and ate verboten shortbread cookies on Passover; she’s planning to move to Israel and study to become a rabbi), and other subjects of substance: their relative closeness to the family patriarch, their cultural assimilation, even the validity of their love relationships. But the crux of their current enmity is who most deserves to inherit a cherished family relic: the Chai necklace (symbol of life and luck) that Poppy kept hidden throughout his concentration camp incarceration, and later used to propose to their grandmother. Daphna sees the Chai as a religious emblem, and as the one who cares most about their religion, she thinks she should have it. Liam takes a completely secular view, and sees the charm as part of a romantic story, one he’d like to replicate with sweet, clueless Melody. Liam’s younger brother Jonah (a spineless, slacker video-game fanatic) has little to say throughout the screamy, hate-filled, knock-down battles between his brother and cousin. But in the end, he manages to shock everyone into silence. So…provocative title, provocative play. The characters aren’t endearing or appealing. But that’s not Harmon’s concern. He’s looking at Millennials in particular, the last generation to have direct contact with the dwindling population of Holocaust survivors. The questions that interest him are: How to deal with that legacy? What is their concept of faith and how does that manifest in how they intend to terminate or perpetuate their religion? There’s much food for thought, a great deal to stimulate post-production discussion, and oh, did I mention?… lots of laughs. The Cygnet Theatre production is excellent, from its Upper West Side studio apartment (with its view of the Hudson, it’s just a trifle, really — a gift from Liam and Jonah’s parents to their darling sons), crowded now with a fold-out sofa and two mattresses on the floor (set by design whiz Sean Fanning), subtly lit (R. Craig Wolf). The performances are outstanding. As Daphna, Danielle Frimer has big hair, a bigger mouth and a holier-than-thou attitude that makes you want to jump up on the stage and strangle her. But she’s thoroughly believable in her self-delusions and moments of clarity. Josh Odsess-Rubin makes Liam a tightly-wrapped, barely controlled, seething mass of contradictions. Katie Sapper is hilarious as Melody, who majored in opera but seems to be nearly tone-deaf (she’s kind of tone-deaf when it comes to understanding this family, too). She starts out by saying, “Stop! You can’t talk to each other like that!” (Oh, can’t they?) But she gets a bit of revenge on Daphna in her way. Tom Zohar has perhaps the fewest lines, but his body language and facial expressions are priceless. As Jonah, he is forced, or allows himself, to be the shuttlecock batted around by his more aggressive brother and cousin. He refuses to take a stand on almost any issue, and he presents as a total wimp — except he does the most risky thing of all. Gifted director Rob Lutfy (Cygnet associate artistic director) has guided the show with a well-timed, well-paced delicacy that belies its intricacy. The play is likely to provoke you – in more ways than one. If you can get past the ferocity, you’ll find some juicy issues to gnaw on (if you’re not gnashing your teeth, or wiping away tears of hilarity). Performances are Wednesday and Thursday at 7:30 p.m., Friday-Saturday at 8 p.m., Sunday at 7 p.m., matinees Saturday at 3 p.m. and Sunday at 2 p.m.